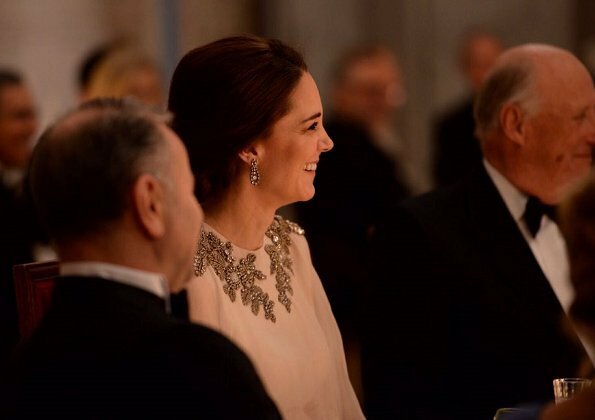 In the evening of February 1, 2018, King Harald V of Norway and Queen Sonja of Norway held a state dinner at the Royal Palace of Oslo in honour of Prince William, Duke of Cambridge and Catherine, Duchess of Cambridge. 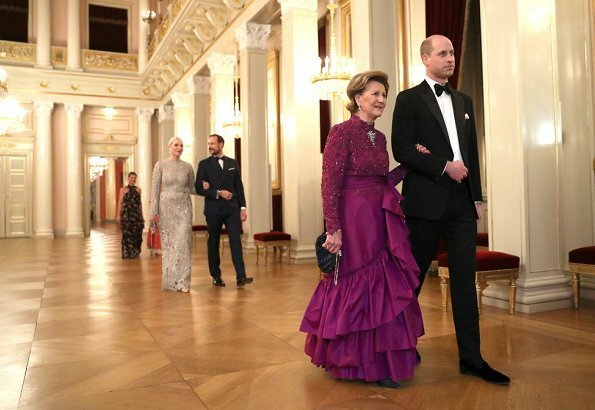 Crown Prince Haakon, Crown Princess Mette Marit, Princess Astrid, Mrs. Ferner, Princess Martha Louise of Norway and members of government attended the gala dinner. This is so much better then what we saw in Sweden. Gives hope for tomorrow. She looks like a dream princess in floating rose and sparkles. Perfection. 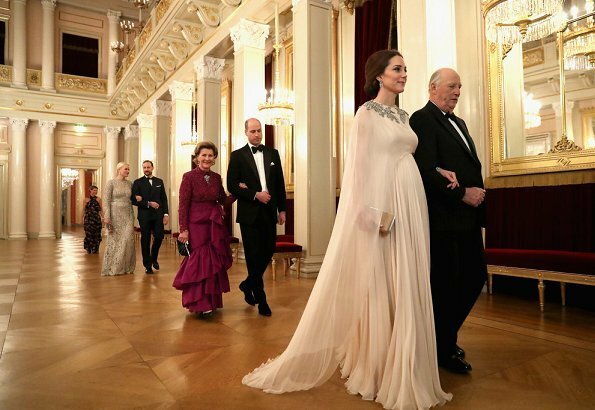 Catherine looks great, and Mette Marit looks very nice as well. 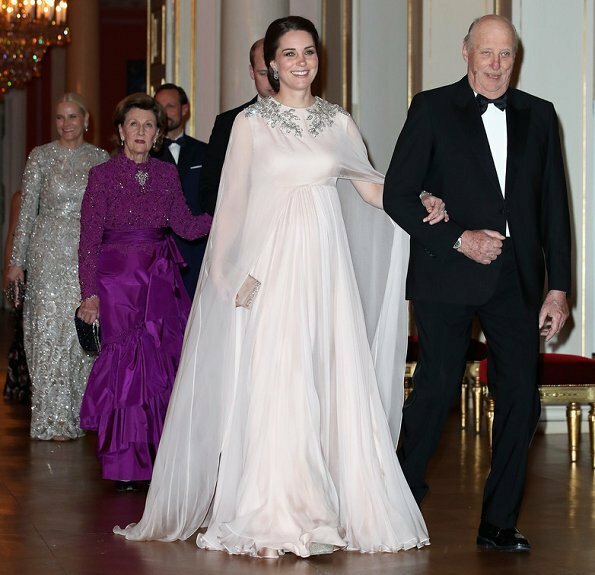 Don't care for all the ruffles in Queen Sonja's dress. Wow! Kate looks beautiful. And I like the way MM looks also - very elegant. All the ladies did well tonight. I just wish we´d see some flattering neckline somewhere. 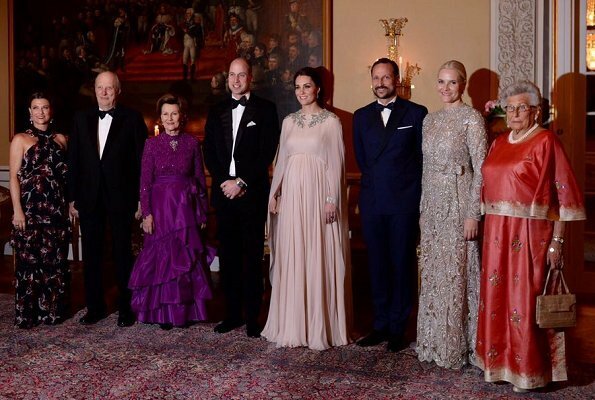 They all look so closed up - except for Märtha Louise who looks rather summery, again. Agree about Märtha Louise looking much too summery. All the other ladies look great! MM really stepped up her game! Hallejulah! She looks lovely. All the ladies look lovely. A picture is worth 1000 words, we see what we want to see. Catherine is expecting her third child, and Martha-Louise and Astrid are included. It is nice to see that family is valued. 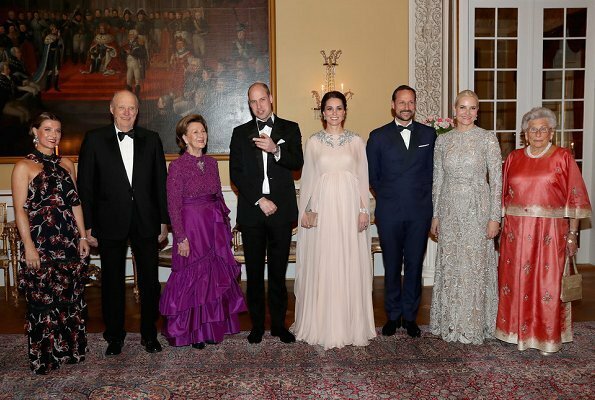 Catherine's dress makes a statement, yet it looks awkward for a dinner. May be better for a ball, with dancing. Everyone was perfect. 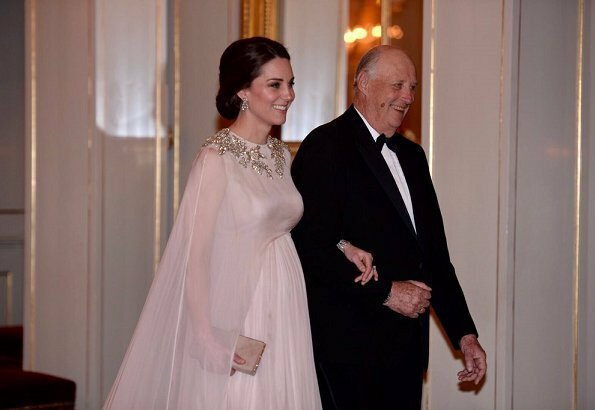 Catherine's gown was gorgeous, hair perfect, and makeup too. I didn't think it was too heavy. Just thought it was a formal, night look for someone who's 36. Mette marit is the star tonight. Just beautiful. I must be the exception, although not horrible, this dress reminds me of an embellished negligee from the 60's. MM much better than usual. You're not the exception. I hated it and actually did think it was horrible. My first thought was "Valley of the Dolls." Fortunately she looked amazing the following day! All the women look lovely! I enjoyed the jewels and each royal's choice tonight! MM looks stunning, really beautiful! Martha-Louise in herself looks lovely, but I don't particularly like her gown and I think Catherine's dress is dreadful, a very dated design. They all look good and happy in each other's company. This look reminds me so much princess Grace of Monaco. Catherine and M-M very regal, Märtha-Louise too summery..
Amazing fairytale dress that suits the Duchess personality like a glove. Very stylish and elegant on the arm of the King. The dress is complimented with the diamond earrings and bracelet from Queen Elizabeth. Diamond bracelet was Prince Phillips wedding present to the Queen. Gorgeous. Yes! Dress, style, hair, make-up, smile. You are so right, she is the star of the evening! I always thought that MM has the "wow" factor. Here's proof, well done. This dress reminds me of the dresses Elizabeth Taylor wore in the 70's. Horrible. 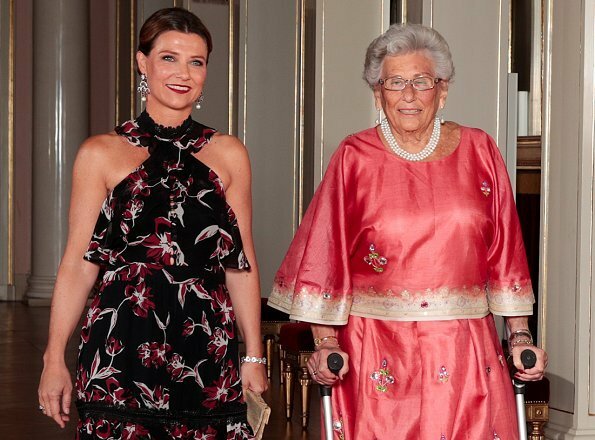 How nice to see that he royal pcincess Matha-Louise and princess Astrid are joining in. They are both looking very nice and happy.